A tricky goblin has stolen your gold, and now you must navigate perilous dungeons full of traps, enemies, and secrets. Bard’s Gold is an arcade action platformer with lite rogue and RPG elements to mix it up and keep things interesting. Right off the bat, you are presented with a few different difficulty settings to begin your journey into the caverns a crafty goblin has escaped into after poaching your pouch. Normal mode, where you are given four lives and have checkpoints, hard mode, where you get fewer lives, and roguelike, where you have no checkpoints, and 2 lives, but you start back in the same spot you died. While the last is the most unforgiving, it can help you grind up your gold count in a hurry upon failure. I will start this off by saying that after playing so many roguelikes in the last few years, I’ve just grown incredibly weary of them. A big drawback to the mechanics that make up the genre/sub-genre is that too often games don’t properly implement rewards systems based on progress made on individual runs. Bard’s Gold fixes that complaint, in my eyes, and does it in a very simple manner. Instead of just allowing you to unlock new items or weapons that MIGHT turn up as a means of making your subsequent runs more successful, it allows you to unlock permanent bonuses that carry over into future runs. Upon death, any unused gold can be used to buy progress towards a permanent boost to lives, money drops, etc. That way, all of the progress you made on your current run doesn’t feel completely wasted. The other way in which they mitigated this issue, is that while you will get a random level sequence on every run, there are a limited amount of levels that you will encounter. As such, you can actually become familiar with trap and enemy placement, and this pattern recognition makes runs that include these levels easier to overcome and a rewarding sense of accomplishment from remembering the patterns and secret item locations. On the subject of secret items, Bard’s Gold does a great job in not only pushing you to find these items, but also rewards you for locating all of them in any given level. To really illustrate how this is done, I’ll elaborate more on the general game structure. Bard’s Gold takes place in a series of single-screen levels. Within these levels, there are platforms, enemies, doors, keys, and treasure. Treasure is your “score”, but also acts as currency at the shops peppered throughout the game, and acts as experience points to be spent upon death, While there are treasure chests in the game, most of your treasure will come from defeating enemies. You start off with a throwing knife, but can also buy more weapons from shops. Be careful, however, as you lose your upgraded weapon when you die. You only get one hit before death, but there are shields available from shops. In addition to treasure dropped by enemies, you will also occasionally be rewarded with a power up or special item. A common special item is the magic glasses, that make secret treasure glint on the screen. The most common power up that I found was a range increase for your weapon. When you discover all of the secrets within a level, you will be given a treasure chest full of gold (gems/currency/treasure). Sometimes there will be a boss fight triggered by finding all of these secrets, and other times you will get a special sub level that looks like Halloween World. Like traditional games, each enemy has its own movement and attack pattern that you need to learn to best overcome them. Most of them only take a few hits with your standard weapon, and this is reduced with the upgraded weapons (such as the chakram, three-way dagger, and axe). The different weapons all have their strengths and weaknesses, and each have their own pattern when used. Default throwing knife goes straight, three-way goes straight, up and down to the left/right (depending on the way you’re facing), the axe goes in an arc in front of you (although not as drastic as the arc from Castlevania games), and the chakram rolls out in front of you lower to the ground, and then returns. Bosses are also just a matter of pattern recognition. Most of their strategy, as is the rest of the game, just waiting for your opportunity to do damage without getting hit. Bard’s Gold finds its difficulty in one hit kills, not in overly complex or tricky enemy fights, precision platforms, or cheap enemy placement. Your own impatience or unfamiliarity with a level is what costs you lives. Within each level, your goal is ultimately to locate the key which unlocks the door to permit you entry to the next portion of the level. This, coupled with the single screen structure, shops for items, and enemy behavior, really calls to mind the classic NES series Wizards and Warriors. While the two games aren’t an exact match by any means, Bard’s Gold does seem to draw heavy inspiration from it, and can best be described as a more tightened up version of that. It feels almost like Bard’s Gold could have been the arcade version, and Wizards and Warriors was the best attempt at converting the game to home consoles. In W&W, your knight can jump ludicrously high, and when he falls can take damage (he has a life bar, as opposed to one hit kills). In Bard’s Gold, you can only jump reasonably high, but have the ability to double jump from the start. In addition, you’ll often be falling far distances to recover gems dropped by enemies. When I first started playing Bard’s Gold, I actually quit out of the first few levels and was ready to start looking up videos online because I didn’t know that you could double jump, and so was unable to go anywhere in the first level because all of the platforms were too high. Thankfully, I figured out the double jump/wall jump pretty soon after that. The game is designed to not have a tutorial on purpose, and so that satisfaction of figuring everything out on your own is an enhancement to the game’s overall experience. I have had a lot of fun in my time with Bard’s Gold, and have actually found it to be one of the more addicting experiences that I’ve had on my Nintendo Switch. It actually took the crown from Binding of Isaac, and that is quite the accomplishment. 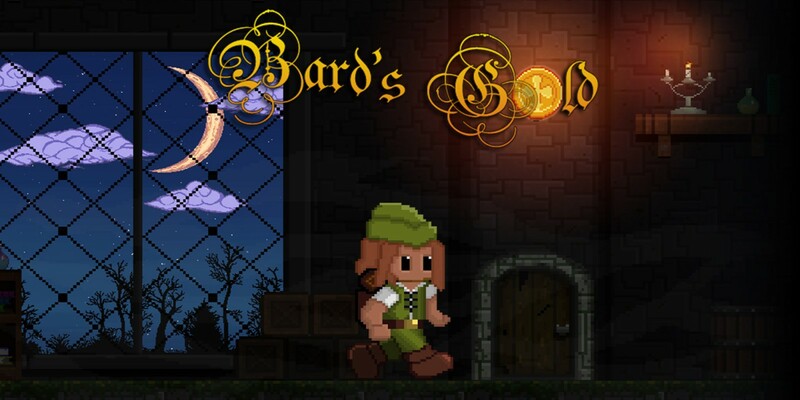 While I can’t really cite anything super innovative or enticing about the game other than repetitively simple and rewarding gameplay, Bard’s Gold is still among my favorite games recently played.